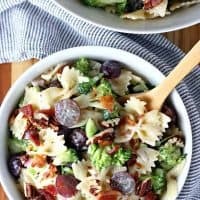 BROCCOLI BOWTIE PASTA SALAD — Farfalle pasta is tossed in a sweet and tangy mayonnaise dressing with broccoli, grapes, bacon and chopped pecans in this unique and tasty salad. 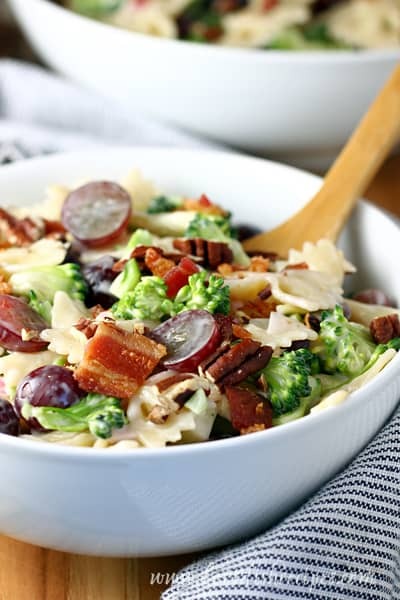 Chances are, you’ve come across a version of this Broccoli Bowtie Pasta Salad on Pinterest. There’s a good reason for that–it’s absolutely amazing! If you’re thinking pasta, broccoli and grapes sound like a weird combination, you’re going to have to trust me on this one and give it a try. You won’t be sorry! Did I mention there are crunchy pecans and crispy bacon in there too? Everything comes together in a sweet and tangy mayonnaise based dressing for a salad that is going to knock your socks off! In fact, this salad will probably become your go-to dish for potlucks and neighborhood barbecues. And everyone will ask you for the recipe. Like I said, there’s a reason this recipe is all over the world wide web. You can put this salad together a day head of time. You’ll just want to hold off on adding the bacon and pecans until serving. Nobody likes soggy bacon! It really doesn’t matter what color of grapes you use. They both taste great in this salad. I usually go for red grapes to add more color, since the broccoli is already green. But that’s purely for aesthetics–the color of grapes won’t change the taste of the salad at all. And if you have time, I highly recommend toasting your pecans for added nutty flavor. 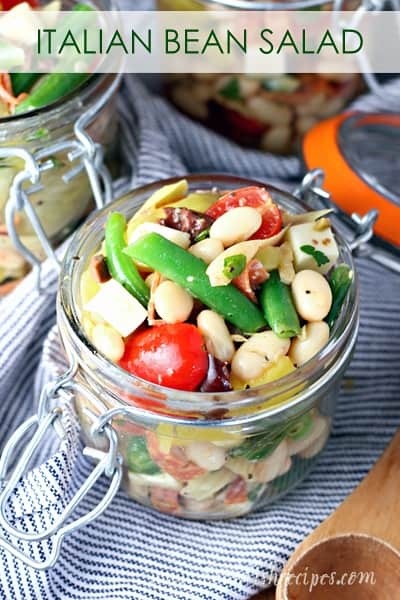 One thing is for sure, all of the amazing colors, flavors and textures in this salad come together to create something out-of-this-world delicious. This is one recipe I never get tired of making or eating. 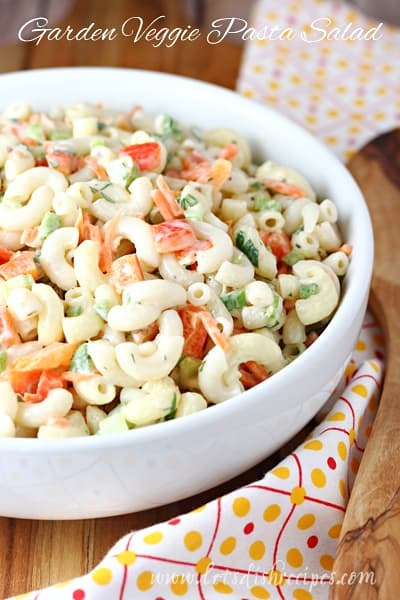 This Broccoli Bowtie Pasta Salad is a hit wherever I take it. And in the summertime, when it’s too hot to cook, it even makes a great main dish with a side of crusty bread. Enjoy! 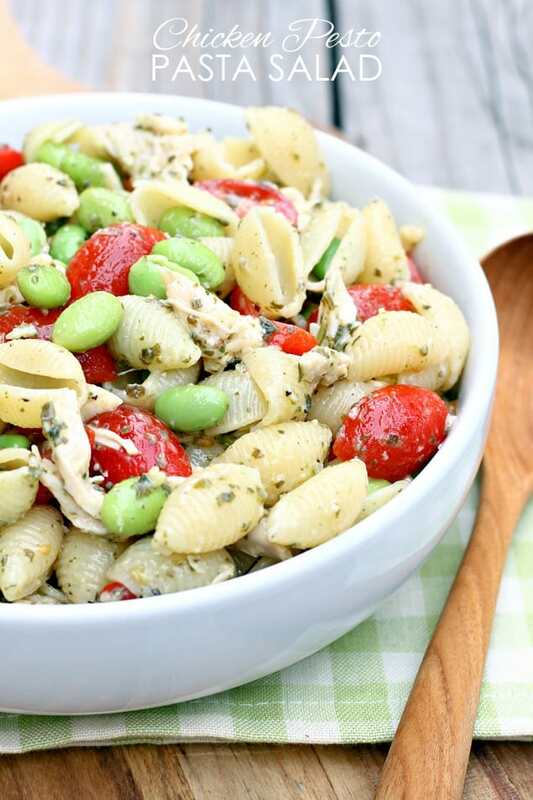 Be sure to save this Broccoli Bowtie Pasta Salad recipe to your favorite Pinterest board for later. 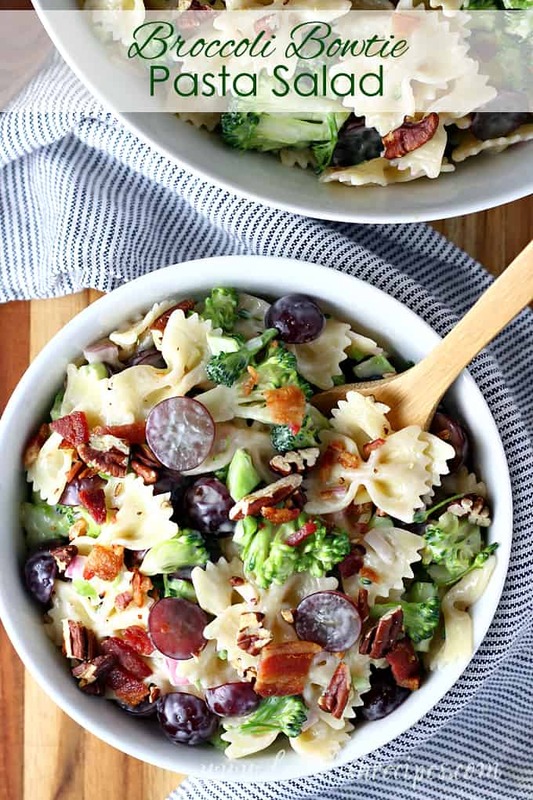 Farfalle pasta is tossed in a sweet and tangy mayonnaise dressing with broccoli, grapes, bacon and chopped pecans in this unique and tasty salad. Prepare pasta according to package directions. Rinse with cold water and drain. Whisk together mayonnaise, sugar, red onion, vinegar and salt in a large bowl. Add broccoli, pasta, and grapes, and stir to coat. Cover and chill 3 hours. Stir bacon and pecans into salad just before serving. So I didn’t know that I wanted the combo of broccoli and grapes until I saw them together here. I could totally see how that would work and it looks amazing! It’s surprisingly delicious! Thank you!